I was a little wary of reading Oleg Atbashian’s Shakedown Socialism when I saw that there were only three one-starred reviews, one of which seemed to be written by a person who had actually read the book. I thought that surely a book that had attracted so little animosity from Liberals who post one-starred reviews of books they don’t read couldn’t be very good. I am pleased to admit that I was wrong. Shakedown Socialism is very, very good. This slim volume, it is only about 130 pages, was written by Oleg Atbashian, a propagandist from the former Soviet Union. Despite his job, he became disillusioned by life under Communism and still more by the chaos that followed the fall of the Soviet Union. He immigrated to the United States, expecting to find a land of freedom and prosperity. His expectations were largely met, but he also discovered, to his surprise, the same sorts of ideas in the heads of many Americans that had led to such disaster in his homeland. To a great extent, Shakedown Socialism is his response, along with his satirical website the People’s Cube. As I said, this is a short book and very readable, yet Atbashian is able to demolish the pretensions of Socialism, Unions, and the quest for economic equality and justice far better than many weightier tomes. He demonstrates that any equality, except equality before the law cannot be achieved by raising everyone up but only by pushing everyone down to the lowest common denominator. Unions provide higher wages to their members only at the expense of non-unionized workers. Government control of the economy, even in the name of fairness empowers the crooks and parasites to seek unearned wealth and power while discouraging the hard work and initiative that creates wealth. This is not idle theorizing on the part of Mr. Atbashian. He has seen the dire effects of this kind of thinking on two continents. I highly recommend giving this book out to any acquaintances who still follow the Pied Piper of class envy and economic “justice”, and particularly to any young person going off to college. 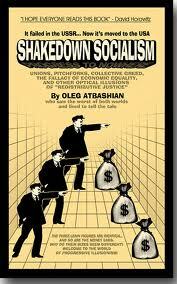 Reading Shakedown Socialism might just immunize them from the Left-wing indoctrination they will face.